After finding my roots in the tiny fishing village of Lacco Ameno, Ischia, I became a dual citizen and was beckoned to live in the country that my family had to abandon in 1904. They would never live to know that their dream would be fulfilled through their children. They would never live to know that a century and three generations later, the circle would be completed, returning one of their children back, to love as they never could, the land that was once theirs. I have been spending many delightful days this week guiding bike tours in the Tuscan hills of Florence with happy cyclists, soaking in and sharing the very best delights of Tuscany. With stops along the way to tell stories of the landscape, its history, its culture, its castles. Each stop is a special moment. The scenery changes daily with the progression of the season, so there are always new surprises to discover, making every day a unique adventure. There is simply no better way to experience Tuscany than on a bike, and I feel very lucky to be able to enjoy this pleasure along with happy clients as we tour the always pregnant back roads of the Tuscan countryside. So many of my clients say that this ride has been the highlight of their trip to Italy, and it feels great to know that I made it happen for them. This week the Sangiovese grapes are starting to explode with spectacular color, adding delightful and sensual dimension to the vineyards as they start to ripen up in anticipation of the approaching vendemmia (grape harvest). 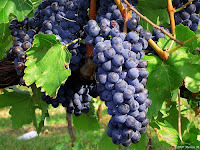 I have been making stops to pick and taste the grapes right off the vine on the side of the road with my groups. They are growing more abundant and tasting sweeter and more pungent every day. The clients get a real kick out of this, because for many, it is the first time they have seen a Tuscan vineyard. And I get the double pleasure of getting a kick out of it myself, and getting a kick out of them getting a kick out it! This week was chock full of natural surprises along the road. On yesterday’s ride we also rode past apple, peach and plum orchards, and…….. …..While guiding my group along a hilly shaded road, I unexpectedly sighted a large porcini mushroom growing in the woods all by itself in the middle of nowhere. I signaled the group to stop their bikes. I dropped my bike to the ground and climbed up the hill. I picked the mushroom and brought it down to my group. It was the size of a small eggplant and its smell was so intense, you could smell it from yards away. The group was drooling with excitement at the find. I cleaned it off, broke it into pieces and we shared it on the side of the road. We only wished for a bowl of tagliatelle to accompany it. If that was not enough, a few kilometers further down the road, I saw vines of blue and red raspberries growing up the trunk of a cypress tree, so we stopped for yet another tasting, and the berries were super sweet!! I also stopped to show them what a bay leaf bush looks like. At the Le Corti winery where we had lunch, capers were spilling out of the stone walls surrounding the villa. These are the special, priceless gifts that make the Tuscan experience come alive for everyone in a very sensual way. And in the spring and autumn there are other equally thrilling gifts of nature to share, such as sunflower fields and olive trees ready to spill their fruit, the Pini (pine nut trees) and chestnut tress dropping their cones and nuts to the ground. As I leave the quiet peaceful Tuscan countryside, I return to Florence after a day working on my bike. As I approach Florence, the sounds change as I transition from country to city. The contrast is sensational. I cycle through the city wall of Porta Romana into the traffic as I start getting pumped by the energy of the city. I cross the Ponte Vecchio and pause along the Arno to absorb the sights and sounds of Florence welcoming me back into its arms. I gaze at the image of tourists strolling in awe. I hear the buzz of motorcycles scooting around. I see the colorful reflections of light shimmering on the Arno. I thank God for a great day and the opportunity to share it with others.